I don't think I have posted any photos of myself on this blog apart from this one. I'm pretty camera shy. 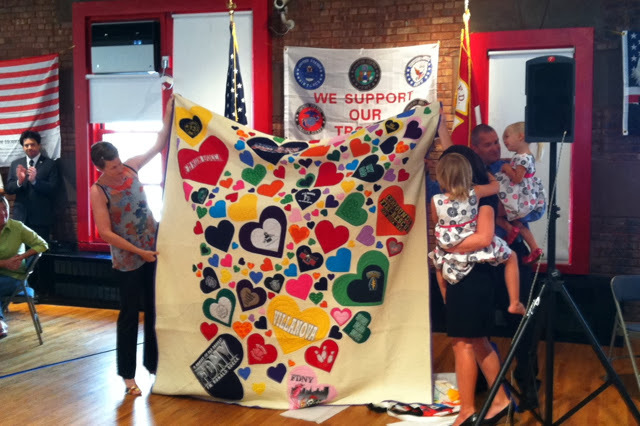 But here is a photo of me presenting the 9/11 Firefighters Memorial Quilt at the New York City Fire Museum on 9/11 this year. How fun to see you Rachael! Your quilt looks AMAZING!!! Thanks, Rachael, for this post! The quilt must mean so much to the family. It's full size. That's super and I'm sure the family loves it. Do you think you would be able to pick me out in a crowd? Thank you - they really loved the quilt. It does - and they are such a lovely family. When someone asks me to make a memorial quilt it means so much to me too. Yes - it is somewhere between a full and a queen.